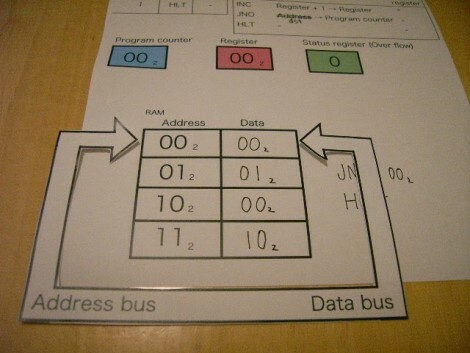 Another similar project is the “Little Man Computer”, which even has Java emulations. It does not have three instruction sets: it has an instruction set consisting of three instructions. >>Fetch the instruction . Read data on address 00(2) . Data is 00(2). This means jump if not over flow . Thank you Hackaday. I’m a TA in an Assembly class and I’ve been needing a visual aid to teach to high school students. I may have to do some expanding to cover all that I need to though. Sorry I couldn’t find a typo before wrote page. I fix the typo a minute ago. There are a few errors in the writeup and this page’s description, but overall a very neat way to demonstrate how a processor works at the lowest level. Well, I suppose you could get into how the transistors and cache store the data on the silicon, but that’s not so much computing at that point. Fetch the instruction . Read data on address 01(2) . Data is 01(2). This means jump if not over flow . Status register is 0 . So CPU should jump to somewhere . But CPU doesn’t know which address to jump . Read data on address 10(2) . The data value is 00(2) . CPU know a address to jump . how does it now know to jump? BUT why does it(jump) when the instruction(00) is to increment the register by one ??? Well, you probably took it from the bad end. The 01b is a 2-word (where word means a group of 2 bits for now) instruction. In case the condition is met, the processor jumps to the address specified in the operand in second word of the 01xxb instruction. In case the condition is NOT met, then it jumps to the next instruction. Therefore it jumps 2 words further, effectively jumping to the address 11b. Here it reads the 10b instruction, thereby halting the system. The captions are a little confusing but if you just look at the picture realizing that some are doubles it makes perfect sense. There’s so much Engrish in this, I just can’t force myself to read it. At least use Google Translate from a language you know well. There is a CARDIAC community over on G+ where you can get all the files to make your own CARDIAC as well as the manual. The last place I was able to purchase an original CARDIAC was from Edmunds but even they seem to have run out. Making your own is not hard and it also gives you the chance to skin it to fit your own personality.